Home › Classes › New patterns using gorgeous Mrs Moon yarns ~ and a great giveaway on Instagram! We’re so excited about all the wonderful new patterns that use Mrs Moon yarn! A favourite at Loop, the different bases from Mrs Moon are all super soft and wonderful to work with and the bright, beautiful colour palette always makes us happy. We have the Plump, the Pudding, and an amazing kit that includes Plump DK. First up, we want to talk about the new Moss Stitch scarf pattern by Mrs Moon. This one uses the Plump yarn, and knits up to make an interesting fabric, almost like weaving rather than knitting! You’ll need three colours in total for this scarf – this sample is shown in Creme Caramel, Fondant Fancy and Marshmallow. We are head over heels for the new Zig-Zag Jumper, also by Mrs Moon. This lovely, snuggly jumper is knitted using the Plump yarn. We will be hosting an amazing giveaway for a sweater quantity for the Zig-Zag Jumper this week over on Instagram. Keep reading for full details! We also also loving the Pinwheel scarf pattern from Mrs Moon. This sweet scarf is crocheted, using 6 different colours of Pudding, with two balls of each colour used. This beautiful photograph was taken by Jonna of Laine Magazine on a recent visit to Loop. In the next issue of Laine there is a guide to London which we can’t wait to see! We have started to take pre-orders for this issue which launches on February 15th – not long to wait now! 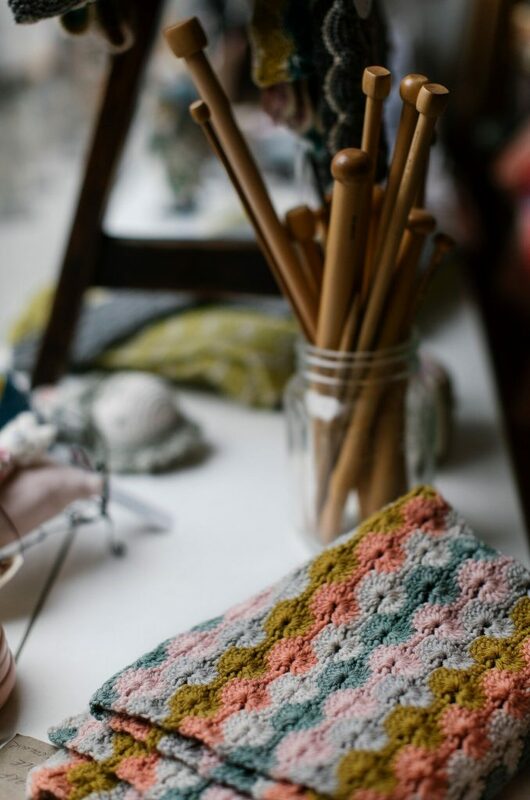 If you love to crochet, we also have the Flower Trellis Scarf pattern from Mrs Moon, that is worked up in five different colours of Pudding. This is a perfect project for experimenting with colour combinations. A new kit from Mrs Moon has also recently arrived at Loop! We have the Sunburst Crochet Granny Blanket kit in stock now. This wonderful kit contains 19 skeins of Plump DK, and a pattern to make up a beautiful and warm heirloom blanket. We also have some wonderful pattern booklets from Mrs Moon – one for lovely knitted baby items, and one for crocheted baby items. The booklet of knits includes the adorable Tilly Cardigan, with delicate stranded colour work – just look at this cutie!. And how could we talk about Mrs Moon yarns without mentioning the amazing new sweater design by Jonna Hietala of Laine Magazine? The ‘Meri’ sweater is knitted on 15mm needles in the Mrs Moon Plump. With a top down construction, this pattern is perfect for beginners, or for more experienced knitters who are looking for a quick knit for the cold winter months. The pattern is available on Raverly, from Laine Magazine’s pattern store. The lovely ladies are hosting a knit along (KAL) for this sweater, and all other patterns published by Laine, for almost the whole of 2019! What a perfect excuse to cast on one of these beauties! Head over to the Laine Magazine website to find out everything you’ll need to know. We will have lots of beautiful samples and brightly coloured yarns from Mrs Moon in the window display of our London store, so if you’re visiting London, or in the area, come and see everything from Mrs Moon in person! Now for the exciting news about our giveaway! We are teaming up with Susan and Karen of Mrs Moon to give one person a chance to win a whole sweater quantity of Mrs Moon Plump, to knit the new Zig-Zag Sweater! The sweater quantity will be in the original pink colour way – with Toffee, Creme Caramel, Fondant Fancy and Bubblegum. This will be open on Instagram only. You will need to follow Loop @looplondonloves and Mrs Moon @mrsmoonyarn, and then post a photograph either of your own or reposting ours using the special hashtag #LoopLovesMrsMoon. Comments on our original post will not be included in the giveaway, you need to do a post in your own Instagram account. This great giveaway will close on Thursday 14th February, and we will announce the winner on Friday 15th. Good luck everyone, and enjoy your knitting! EDIT: When this post was first released, the dates for the giveaway were incorrect. We are so sorry about this. They have now been edited and are accurate. The giveaway will close Thursday 14th, and we will announce the winner on Friday 15th. Really gorgeous things here. Unfortunately, I’m not an IG’er so can’t take part in the giveaway, though I’d love to have.